Following our visit to the Volkswagen brand museum in Wolfsburg, Germany, we trekked over to Autostadt in the center of the city to visit the museum there. Autostadt (a name that literally translates to “car city” in German) is a Volkswagen-themed visitor attraction that houses a museum, a pavilion for the SEAT, Škoda, Audi and Volkswagen brands, a swank hotel, several restaurants and the world-famous car towers, among other features. While the aforementioned Volkswagen museum is like walking through a book that goes into precise details about the German automaker’s history, Autostadt is more like a coffee table book that showcases the 100 greatest auto designs. Jaguar E-Type? Present. Bugatti Veyron. Yep. Citroën DS, Lamborghini Countach, DeLorean DMC-12 and a Porsche 356? Check, check, check and check. 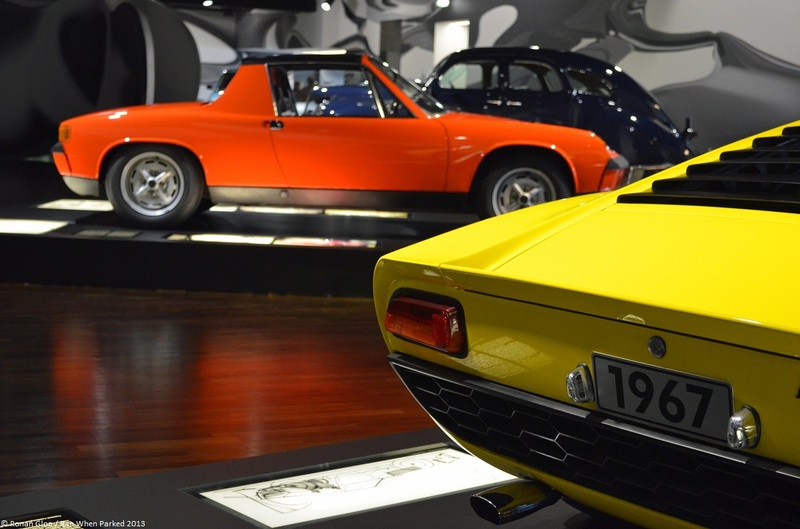 Overall, the museum puts an unabashed focus on cars built by automakers that belong to Volkswagen but there are some unexpected vehicles like a Lincoln Zephyr, a Lancia Lambda, a Citroën 2CV and a Honda S600. Volkswagen has not forgotten the darker periods of its history and a small section of the museum pays homage to Felix Wankel’s rotary engine with a NSU Ro80, an exceedingly rare Citroën M35 and a Van Veen OCR 1000 motorcycle. Our favorite car in the museum was the Karmann GF, a Manx-like buggy designed by German car magazine Gute Fahrt and assembled by coachbuilder Karmann using a modified Beetle chassis and a carbon fiber tub. The GF was launched in 1971 with a 1.5-liter 44-horsepower engine to public acclaim but production ended shortly after because of then-new safety regulations that came into effect throughout West Germany. The GF was available as a kit that sold for 3,000 Deutsche Marks or fully-assembled for 8,000 Marks. Offering an ever-changing collection of cars, the museum is often crowded – hardly a surprise considering it’s in the heart of Wolfsburg’s main tourist attraction – and lighting is not its strong point so we advise you to bring a tripod if you want to walk away with a decent set of photographs. You’ll find a gallery of photos from our visit to the museum below. If some of the pictures look blurry in the preview, click “view full size” on the bottom right of the preview to see a full, sharp image.